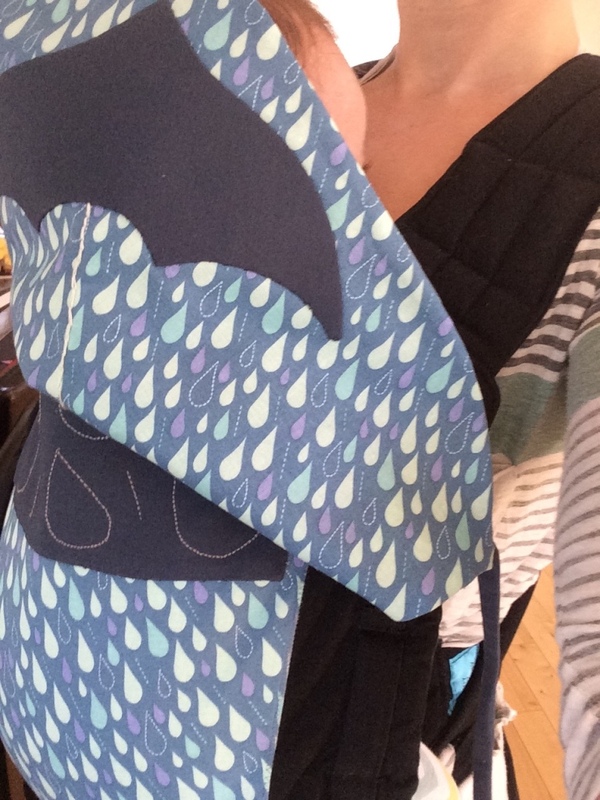 Makeover Your Mei Tai Carrier: Raindrops Keep Falling on My Head – Odds & Hens : Ramblings. Creations. Makeover your Mei Tai carrier! Sadly, this post won’t have exact measurements to guide you inch by inch. This meant to be a narrative inspiration of one way to customize your Mei Tai – easy enough that you can change it with the seasons (as long as you have a good seam ripper). I added a little hood but it is in no way necessary and now the tot’s noggin is too big for it – but it looks cute! Measure the main square panel. Mine was about 12 1/2 inches by 9 1/2 inches. But don’t take my word for it as your might have shrunk etc. This step is optional but cut a panel the same shape as the main fabric from interfacing. Then sew right sides together all the way around. Make a small snip in the interfacing only, and then turn the panel right sides out and give a good press. This is just one of my tricks for making a nice seamed edge. Not necessary – you could just fold and press under a half inch. The interfacing addition would also help hid the print behind if your main panel fabric is lighter. Press, pin and sew the panel down over the top of the original panel. You could use a zig zag, straight stitch or a blanket or your choice. I used a small zig zag. At this step you could be all done. OR you can keep embellishing. I decided to add a small contrasting pocket to the top of the main panel primarily to cover up the Infantino logo but it also add some design points. This pocket was 9 inches by 4 1/2 inches. I sewed the outline of raindrops in contrasting thread before sewing the pocket on. 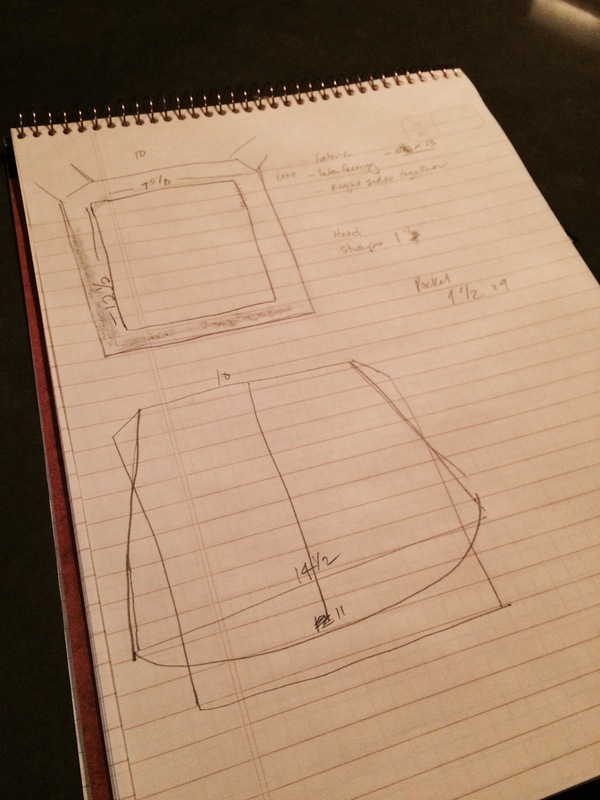 For the hood, I sketched out a trapezoid of sorts with a rounded bottom edge. It was 10 inches at the top, to fit the space between the straps and about 11 inches long and 15 inches wide. I cut it from two fabrics (rain drops and a coordinate). At this stage, I traced and cut the shape of an umbrella on iron on interfacing, ironed it to the the solid blue fabric and then cut out around the interfacing about 3/8 of an inch. You then would press this under, leaving a clean edge when the right side is out. I sewed it down with a hand stitch (whip) but you could machine it down etc. There are several ways to appliqué – pick your favorite. The umbrella handle is embroidered on. The small ties for the hood are made by cutting a 1 1/2 inch strip, pressing in half and then pressing the edge into the center and sewing it together close to the edge with a straight stitch. You could use ribbon too. Stitch down with a couple stitches the ties to the right side of fabric along the rounded edge but the long length facing in (so that when you turn it all right sides out they are in the right corner. Put the hood fabrics right sides together and sew all the way around, leaving a small opening on one of the edges so you can turn it right side out. Turn right side out and press. Sew down the opening with a small straight stitch and then sew the hood to the top edge of mei tai. Again, apologies for whimping out on document all the steps. I really made it up as I went along. Evidence of this below – a not useful shot of notebook. Hopefully, someone finds this inspiring. I put a few other links that might be helpful for you below. Acorn Squash and Apricot Pie – Move over Pumpkin!